If you have set up a home wireless network then it’s very important and necessary that you need to secure the same as if you don’t secure the network then there’s a high probability that hackers and other people may get into your wireless network which could lead to serious security issues. So, let’s check out the ways with which you can secure your home wireless network effortlessly and simply, all you need to do is to just follow some of the simple parameters below with which you can easily secure and safeguard the wireless network. Generally many of the wireless routers come with the encryption capability but its disabled by default. So, make sure that you have enabled either WPA or WPA2 wireless encryption key. To enable this all you need to do is to first click on the “Wireless” option and then the “Wireless Security” option, for enabling the encryption you need to assign a password. 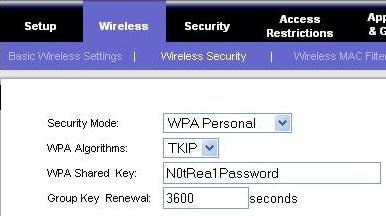 Basically a WEP corresponds to Wireless Protection which can be either 64 or 128 bit, this one is the old encryption method, the new encryption method is now replaced and is now called as the WiFi Protected access (WPA), basically WPA-PSK is more secured than the WEP standard and most of the wireless adapters on the laptop support WPA. Also, there is another standard which is the WPA2, but this has to be supported at both the ends like at the wireless router and at the laptop wireless adapter end. Basically the SSID which refers to the Service set identifier is the name of the wireless connection which can be seen in the list of all the available network connections from the laptop which can be found while connecting to a network. 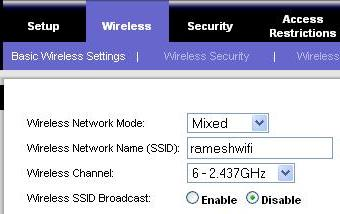 For changing this you will have to click on the “Wireless”>”Basic Wireless Settings” > change the “Wireless Network name (SSID)”. Always ensure that you have disabled the SSID broadcast as with this you can avoid the wireless name from getting displayed on “Available Wireless Connections” on all your neighbors’ laptop. This can be done by instructing the wireless router not to broadcast the name to everybody. Once you’ve disabled the SSID broadcast, the first time when someone wants to connect to your wireless network, you need to provide the name to them. For this you will have to click on “Wireless”>”Basic Wireless Settings” > Click on the “disable radio button which is next to “Wireless SSID broadcast”. 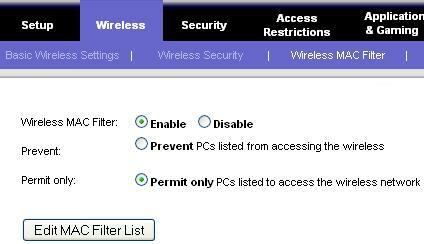 To ensure that the wireless network is always accessed by the trusted and secured Laptops, you will have to ensure that you are only latched to the wireless network when the MAC Address is known to you, basically the MAC address is nothing but the media access control which is a unique identifier attached to most network adapters. In this case, this should be the unique identifier of your laptop wireless adapter. On Linux, do ifconfig from the command prompt to get wireless hardware address. On windows, do ipconfig /all from the command prompt to identify the MAC address as shown below. This is a guest post by Chetan Bhawani,He is a dentist, a tech blogger and a web-hosting adviser at the best web hostingreviews site. If you would like to write for UniqueTipsOnline, check our guest posting guidelines.